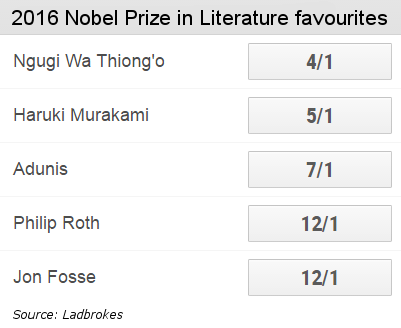 Ngũgĩ wa Thiong’o is the most-backed author to win the 2016 Nobel Prize in Literature, according to Ladbrokes, with regular favourites Haruki Murakami, Adonis, Philip Roth and Jon Fosse close behind. The Kenyan author is a perennial favourite for the award, and was considered a front runner in 2010, 2013, 2014 and 2015. Related: What Does Ngugi wa Thiong’o Have to Do to Win the Nobel Prize for Literature? Ngũgĩ’s influence on African and international literature is immense. In the late 1960s he made the “groundbreaking and ridiculously brave” decision to write in Gikuyu and Swahili, in an effort to revitalise and empower indigenous languages. Last year he was awarded the Nicolás Guillén Lifetime Achievement Award for Philosophical Literature. His most recent book is In the House of the Interpreter. The 18 members of the Swedish Academy decide the award, being an author they judge – in the words of Alfred Nobel’s will – to have “produced in the field of literature the most outstanding work in an ideal direction”. The date for the announcement is yet to be announced, but could be any time from 11:45 AM today – slightly later than usual. The Academy’s Per Wästberg told Swedish press that the winner would be revealed on 13 October, amid rumours of disagreement among members. The Academy never gives any indication of the authors under consideration, however the winner’s name has been leaked on occasion. The official shortlist is only revealed 50 years later – in this year’s case, 2066. Belarusian investigative journalist and non-fiction author Svetlana Alexievich was awarded the prize last year. 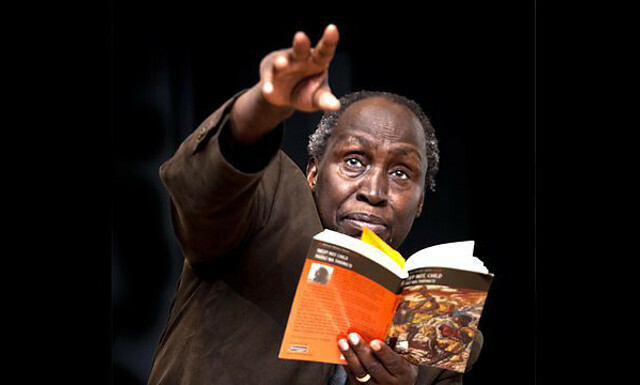 What Does Ngugi wa Thiong’o Have to Do to Win the Nobel Prize for Literature?